Good morning, friends & daughters & my dear husband, Jay who still loves me after all the money I've spent to continue this crazy hobby of mine. This is the first of many Quilt cards I'm sure I will be making. They are an addiction in themselves but so much fun & although they look quite difficult they are pretty simple to make. I added a button to the middle before I sent this one off to my good friend Ruth Ann for a late birthday. I’ve always loved & admired my daughter, Bridgette’s beautiful quilt projects so when I saw a quilt die that could be used to cut paper I popped it into my “cart” & sat twiddling my fingers until it got here ... Once I had it in my hot little hands, I started figuring out how I wanted to use it. It's a great little die & could be used many ways. I wanted to make some cards for my daughters & my very good friend Ruth Ann who is also an amazing quilter. I started by choosing 3 or 4 solids & print patterned paper, placed the die on top of each paper & once I had them all cut out by just one pass thru the die cutting machine. I chose the color over lay I wanted to use & started designing my quilt. It's SOOOO much fun & brought great joy to me. 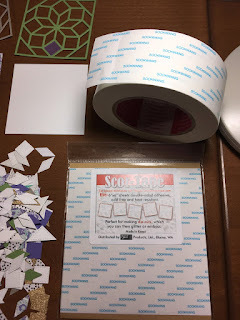 I was trying to figure out how to glue all those tiny pieces inside my quilt square when I remembered watching Pam Sparks tutorial on using the Score-Tape. She is AMAZING... I cut a 4 x 4 inch piece of white card stock, placed it on my desk then put any color of the quilt block on top of that. Then begin inserting my tiny quilt pieces into the design using colors I liked best. Once I could see what I liked or wanted to change it was easy to pop any of the pieces out & rearrange them since they weren't glued down yet. Now that I have the pattern, colors & design to my liking I take a new 4x4 square of white paper (or any color you want) lay it down & use Scor-Tape to cover the whole white square so it's all sticky. 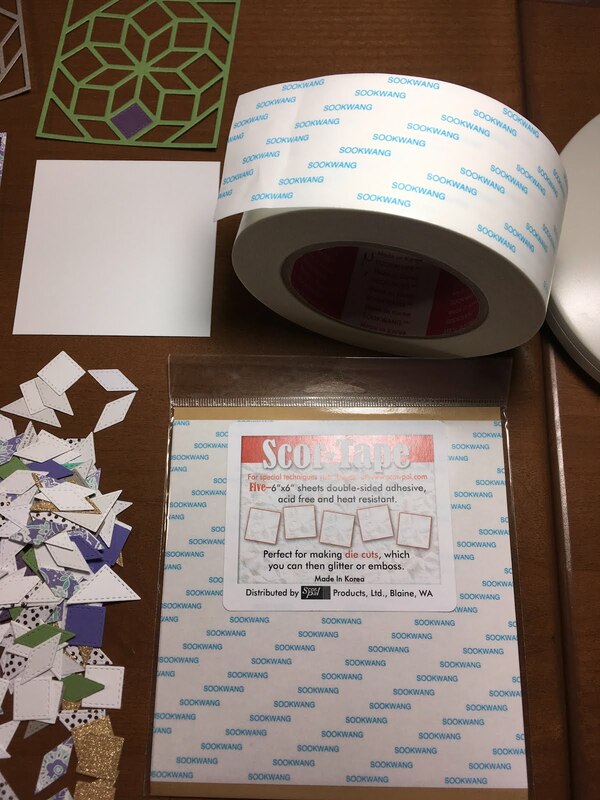 I used 2 strips of 2" Scor-Tape and gently place a 4x4 paper quilt die-cut onto the sticky paper & you have your "puzzle layout" .... Use a Bone Folder to press it smoothly avoiding the sticky areas. Now you're ready to finish your design. Thanks for staying with me this long. I appreciate each & everyone of my viewers. I was so thrilled to be able to attend another set of Heartfelt Creations classes in Puyallup, WA over the weekend & love them as much or more now than I did when I took my 1st classes in Nov last year. The classes & the teacher makes them so enjoyable & you walk out of there with some beautiful cards & this time we made a little mini album out of some of their gorgeous papers & dies. Click on pictures to make them larger if you like. Love how it folds up & out !!! I made some vellum roses with Heartfelt Creations stamps & dies & popped one on this mug. Made some more flowers with just cardstock & used it for this. This cute little shoe card was made last night & going to a young lady who will probably get a "KICK" out of it ... The flowers & leaves were all made ahead of time & came in handy to add to this. I wish you could see the sparkle but it's not showing up. NOW that was fun to make & although I have glitter everywhere, it makes me happy !!! 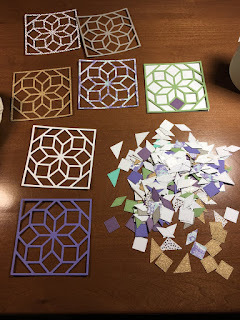 I was fortunate enough to be able to attend CK Convention in Tacoma, Washington a few weeks ago & we made these wonderful cards & flowers in the classes I took ... 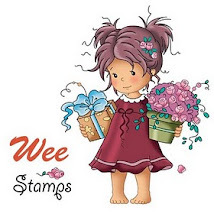 I loved their stamps, dies & papers so much I became a Platinum member so I could get 20% off everything I buy from them ... I still need to add a little glitter & centers to these beautiful cards but I wanted to share with you some of what we made. This shoe shaped card is my favorite. It's been stamped with Colorbox pigment ink, sprinkled with embossing powder then heat embossed & cut out with the matching die...You could leave it like this or add several more beautiful flowers. I'm going to cut another shoe shape from a matching paper for the inside to finish it up. These pretty little flowers are just made from paper & shaped with the Heartfelt Creations Deluxe flower shaping tools. If you click on the pictures you can see the glitter & the center Prills close up. Blogger is just NOT playing nice with me !!! It still won't let me access pictures from my iPhone to use on my blog so I'll just post a few pictures of older cards until I can get this sorted out. I've got my laptop in the shop & maybe tomorrow when I get it back things will work as they are supposed to. And made an easel card with her. Punched a few flowers out of pretty paper & layered them up with a pearl popped in the middle. Thanks for your encouragement as I try to get back in the swing of things. Finally got my computer back & am now able to upload pictures to myblog !!! I'm soo happy !!! I made a tassel out of embroidery floss & added a bit of Glossy Accents to give the balloon a bit of shine. Nothing fancy but it feels good to be back posting ... It's like the saying "If you don't USE it you LOSE it"...So I'm going to start using it !!! I saw a challenge over at the Magnoia-licious Challenge Blog to make a bookmark so decided to use a new tag die & cut her out & enter just to make sure I still know how. Just trying to get the hang of it again .... Guess it's like riding a bicycle, hope I don't fall off !!! I just love the Tilda images & this one in particular. She looks like she just wants to give you a hug ..Who doesn't need one those. The flowers were punched & then glued together & a tiny pearl added to the center. 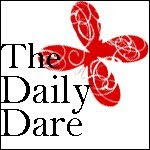 I found this little icon on the internet & it so made me smile ... It reminds me of ME !!! I never have to hide any of my craft supplies from my husband, but I do find myself leaving things in the trunk of my car to unpack later just because I FEEL a little guilty after some of my shopping trips ... 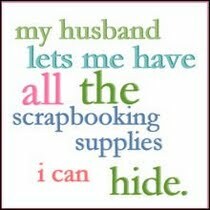 I LOVE all scrapbooking & card making supplies. Stamps, paper, ink, all the cool tools & NOW I just need to get back to using them. I’d like to wish my very good friend Ruth Ann a “HAPPY BIRTHDAY” today !!! There’s never a day that goes by that I don’t think of you & miss the get togethers we’ve had playing with our stamps & dies. I’ll be home before you know it & we must plan more time for those days. I have enough supplies to rival Michael’s or JoAnns & still I procrastinate about getting cards made for those who mean so much to me. Neither of my daughters received cards this year & now here it is my sweet friend Ruth Ann’s birthday & no card sent off to her YET either !!! I do have a little something for her but as is the “norm” for me it will be late … I was thinking of you when I got it & should have had it in the mail days ago. This is a recipe Ruth Ann shared with us & everyone added their own stamps & dies to make it original. Angel Fluff is a favorite made for most every holiday when my girls were growing up. Now they have families of their own & are continuing the tradition … Its like eating a slice of heaven … yummy !!! Another family favorite, Poppyseed Chicken … LOVE this stuff & the real butter & cream cheese is offset by the chicken cuz that’s healthy, right !!! Click on these to make larger if you want to see them better.